XBee is very easy and popular wireless device. It is a transceiver, it can transmits data wirelessly and it can also receives data wirelessly. There are several types of XBee module and it might be confusing. The very popular XBee is Series 1 (802.15.4), comes with the firmware to create connection for point to point or star network. But bear in mind, many people actually thought it is using ZigBee protocol, but it is not compliance to ZigBee because it uses the low layer of ZigBee protocol only. Therefore XBee Series 1 (S1) cannot communicate with ZigBee device in the market. Anyway I don think many care because they just want to communicate among XBee, or wanted to have simple wireless communication. The XBee or XBee PRO is basically the same protocol, just PRO module have better transmit power and better receiver sensitivity. So I will be talking about XBee only, not the PRO. XBee Series 2 (ZB) does not offer any 802.15.4-only firmware; it is always running ZigBee mesh firmware. It is the new XBee module that we are carrying now. XBee S2 have better performance when you talk about mesh networking where it involve quite a lot of nodes: Coordinators, Routers and End Devices. You can read the datasheet if you want to, but I am going to talk about point to point only 🙂 Bear in mind, XBee S2 CANNOT communicate with XBee S1, it is not compatible in term of wireless communication. OK, you want to do simple remote control between your control panel, computer or microcontroller to your robot. Besides sending control command to it, you also want to have feedback such as light, temperature, battery voltage, etc. Can I do that with XBee S2? Those that familiar with XBee S1, I am sure you know you will need to configure the Destination Address and Source Address correctly in order to do this, right? For XBee S2, it is similar procedure, just that you need to make one of the XBee S2 as Coordinator, another as Router. 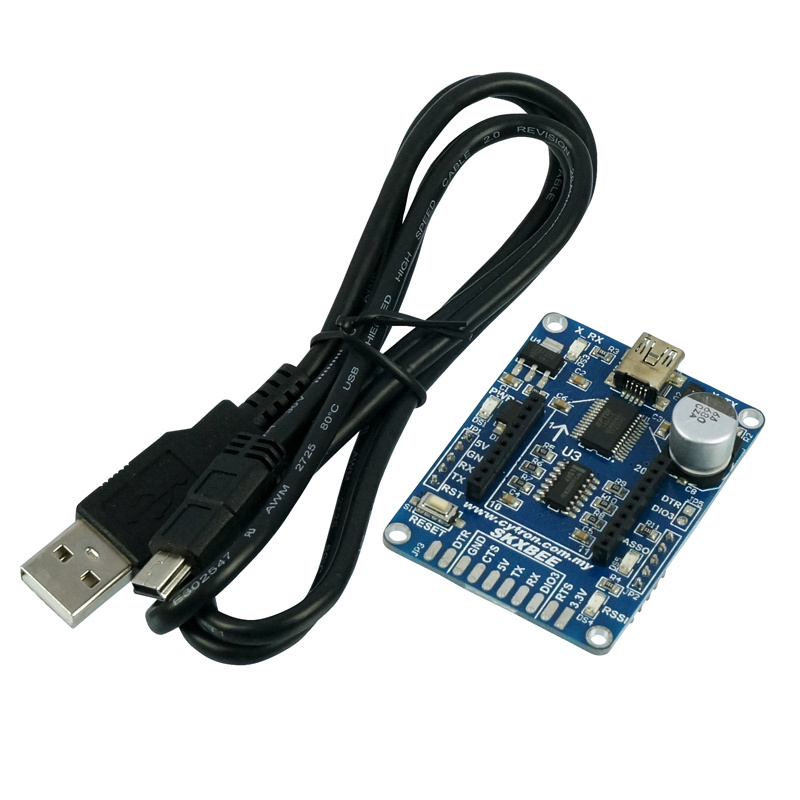 If you order from Cytron Technologies, the price is similar with XBee S1 (at the time I write this), and it comes with sponge and BB-XBee, the breakout board for XBee. How to use the breakout? Refer to this tutorial. Now, I am not going to use the breakout board because XBee module is 3.3V and you will need to hook up to computer for communication in order to configure it. I will use the SKXBee without module. If this is the first time you use SKXBee, you will need to install the driver. Please download the driver from here and refer to the method to install it. Record the SH and SL ID on this XBee S2 module, you will need it to set Router module. In my case, the SH is 13A200, SL is 408C1470. This is Coordinator Source Address. We will need to configure Coordinator again when you get the SH and SL of router :). For the time being, we are done for Coordinator. You can close X-CTU now. Record the SH and SL ID on this XBee S2 module, you will need it to set Coordinator module. In my case, the SH is 13A200, SL is 4086A429. hey, i was wondering, can you do a tutorial on series 1 also ? i’m having problem in setting the values for both modules. i have actually bought two xbee S1 modules, i have well downloaded the latest firmware but i cant see neither coordinator not router in function set? can you please tell me whats wrong? I’m getting an error while writing the for coordinator at. I’m unable to see the SH, SL address in the coordinator window, though I could read the values when I read in router window. Could not open output file. This error does not seem to be from the XBee module, it might be your X-CTU is not installed correctly or the COM port is not installed properly. hi, please i need a module that works on the zigbee protocol. for transmission and reception of signals. Series 2 is ZigBee compliance. i have a problem with my bee pro moudule. it dosent respond ATNI command!!!!! whaat can i do?!!! may it is in sleep mode?!! also the Read buttom in “tab configuration” dosnt read my xbee properly!!! how can i upgraid my XCTU software? Wow! Thank you for a straight-forward explanation of how to configure two XBee Series 2 modules for point-to-point communication. Of the dozen different explanations for configuring XBees that I have read today, yours is the only one that makes sense (your obvious status as an English-as-a-second-language speaker notwithstanding) and yielded results. Keep up the great work! When the Router cannot send a message to the Coordinator, it did not receive. Instead the router receive the message it self. What can be wrong? Clear, concise and accurate description of how to link up two modules. Well explained and laid out. Well done! A paragraph on why a router and coordinator are needed would have made it perfect but not really necessary. In API mode, you can configure it to have acknowledge, in transparent mode, there is no ack. However, that is series 1, I am not sure about series 2. Thanks for the feedback, I will look into it and add in accordingly. Hi, excellent article on setting up two series 2 xbees in AT mode (one coordinator and one router) Your the only one I think that mentions you have to reprogram the coordinator destination address to that of the router. I have followed you instruction and they work great. My question is can three series 2 xbees be setup in AT mode ? (one coordinator and two routers or maybe one coordinator, one router, and one end pt), I would like to do point to multipoint communications. If yes what are the steps to setup the addresses? wanna ask when i type ATVR why the xbee not reply anything?? but the word still display on another xbee.. is it ok? I configure Xbee series 2 module as Router AT with (BR-9600;None-parity) and after that that module is not communicating with X-CTU, And even after hardware reset. How to slove this issue?? I’d like to add something: for some reason if you set the PAN ID to 2345 (as I did first), the pairing does not work. I set it to 1111 and it worked (and I guess 1234 also work). I could not find any other difference in the configuration. 2345 just don’t work. I don’t know the reason, but I hope this may prevent some hair pulling..
i have a problem with my xbee series 2 2mW. my problem is my xbee range work only 2 to 3 meter max But my problem is not about the obstructions between the two antennas, because i already try my xbee range outdoor, still the range work only in 3-4 meter, increasing 1 meter only from indoor trial. so i hope you can answer my problem sir. my spesification is, i use 2 laptops, with xbee-usb adapter v.2 in each laptops, and x-ctu software. please reply this as soon as you can. The range test in datasheet is being test under line of sight and in a chamber where no other RF source, example WiFi, Bluetooth, Microwave, etc. All these RF sources will greatly interfere with the XBee series 1 or 2 because they are all using 2.4GHz. is this possible to baud rate problem? Please discuss in our technical forum, there are too many possibilities that might cause the problem. Thanks for the great piece. I followed your instructions exactly and got my project moving after banging my head against the wall for 2 full days. Since I am novice in embedded sofware development,I m asking for your help . i am working on domotic project.I try to design an encapsulation for [the industrial protocol M-bus(based on RS485 half duplex)]in [ the point to point serial link RS232/UART(full duplex) ](in order to send the data afterward over an xbee) . Honnestly,i’s been three days since i was searching on the net for a way to get that done but right now i’m wondering if that is even possible to design . I’m using a pair of Xbee Pro S2. I followed the tutorial. Congrats for it by the way. All sounds fine with modules, except for the fact that coordinator can’t send messages. It sends (blue) and immediately receives back (red) whatever I type. No message is received by router also. Isn’t that supposed to work? In the other hand, when coordinator receives all messages from router. Is there a tutorial on how to configure Xbee API mode? I am using 2 x Xbee Pro S2B modules. When the setup is complete i can chat with one and the other. But if i remove one and insert it in a Arduino Mega Board with a Xbee shield to display what the other Xbee is sending it does not. What can be the problem? I have posted this problem on many blogs and i have received lots of views but no one could answer me! Maybe one of you can? Hope for a speedy replay. Thank you. Do post your hardware setup in our technical forum. do you know about configuration xbee s2 in mesh protocol, coordinator >> router >> end device??? I just want to say THANK YOU! Purchasing XBee 2, not XBee 1 for simple p2p was a real mistake esp for the novice like me. After reading this excellent documentation, I’ve succeeded to make my two XBee 2 modules to talk each other. hello,is there any possible ways to create mesh network using xbeeS2?And can you please guide me to get firmware for xbeeS2? i am not getting communication between two xbee s2c’s .i am having one doubt the specifications of one xbee s2c is XB24CZ7WIT-004-revG and another one is XB24CZ7WIT-004-revE is there any problem for that rev specification for that those are not communicating? please reply me.